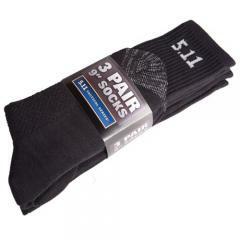 Quite possibly the most comfortable sock you'll ever wear, the 511 9" socks are designed to accompany all of the boots of the 5.11 Tactical Series® family. Constructed with multiple zones of compression and fabric blends for increased blood circulation, heat reduction and moisture wicking, the 9" sock is an integral part of 5.11's footwear Shock Mitigation System. 3 pairs of 9" socks, one size fits all. Excellent socks, well made but just a little pricey for 3 pair. Very comfortable to wear with the 9" SWAT boots. Excellent quality duty socks Feet stay dry and comfortable for entire shift. Unbelievable how comfortable and durable, I enjoy them so much I ordered more. I love the socks, they go well with my boots.